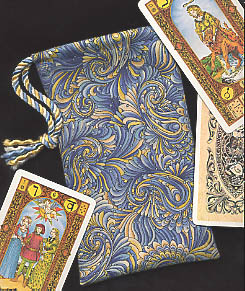 Imaginative paisley swirls of blue, white, yellow, and wheat on this fabric provide a lovely home for a tarot or oracle deck. 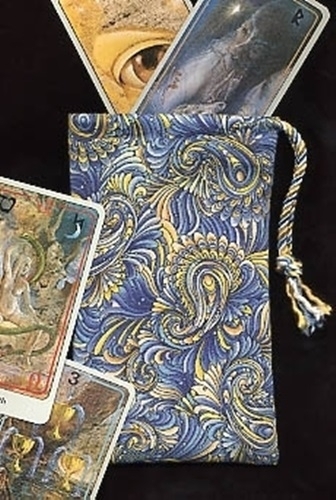 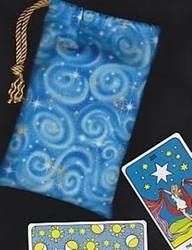 Notice how attractive the fabric of this bag is next to illustrated cards from the decks shown here: Haindl Tarot (right) and Tavaglione's Stairs of Gold Tarot (below). 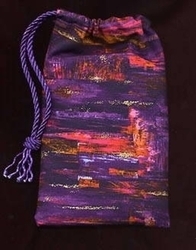 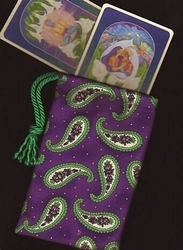 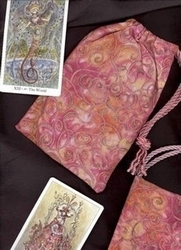 Additionally, this bag makes a lovely home for storing the Rider-Waite Tarot, Tell-Me Tarot, Babylonian Tarot (many feathered wings on card illustrations), The Tarot of 78 Doors, Jane Austen Tarot, or theMystic Faerie Tarot.